I admit that I've never seen Wall Street which many movie experts claim to be a classic. I probably need to hunker down and rent it one of these days. Now there are reports out that Wall Street 2 is in the works and will be directed by Oliver Stone (who helmed the first film). 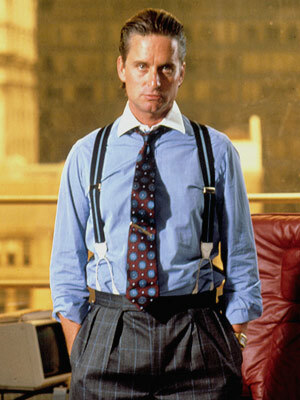 Michael Douglas is set to reprise his role of Gordon Gekko at the ripe age of 65. And in the same formula that produced the dredge that is Indana Jones and the Crystal Skull, Shia Labeouf is in talks to sign-on as an up-and-coming investor. Is Shia going to be forever typecast as the young version of all our cinematic legends? I'm sorry but I can only take so many revivals of movie franchises. Some work (Batman, Star Trek, etc...), but others fall flat (Indiana Jones, Friday the 13th). I'm excited for Ghostbusters 3 but this Wall Street redux (tentatively titled as Wall Street 2: Money Never Sleeps *BARF*) just seems a little forced. Have we really come to the end of originality in Hollywood? Are you serious?!? Yes, it is the end of originality in Hollywood, it happens because the American viewing audience generally has bad taste. You must see Wall Street! I am not an Oliver Stone fan by any means, but it's a classic. It will seem kind of dated, but also quite timely. That must be why they are thinking about a sequel? I am definitely boycotting.